What To Do When the Text Is Not a Straight Line? What to Do When the Text Is Not a Straight Line in the Converted Word File? After opening the converted word file by Microsoft Word program, please select the text, right-click it to choose Font > Advanced > Position > Standard. This function will help you align the text. 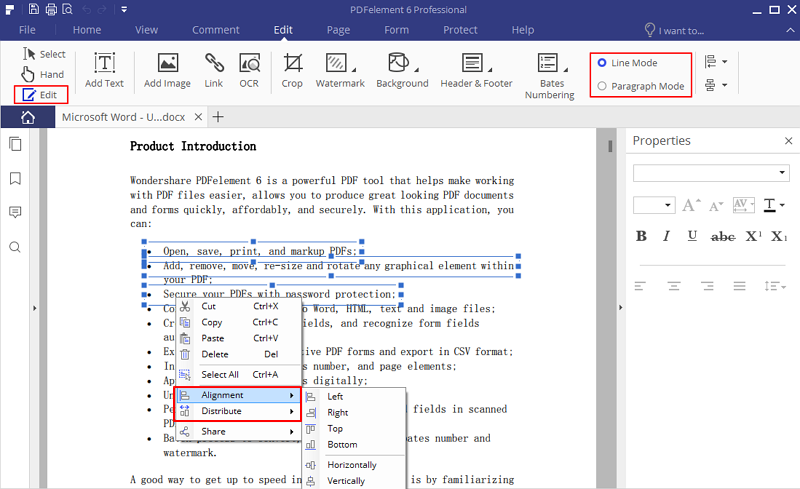 Step 1: Open the PDF file with PDFelement 6. Step 2: Click the “EDIT” button. Step 3: Click the text or the object to select, and hold the Ctrl key to click multiple objects, all the clicked objects will be selected at the same time. Right-click the selected object to choose "Alignment" or "Distribute" option. Select the way you prefer to align the text from the drop-down menu. Why does the Eraser Button Fail to Erase the Text?